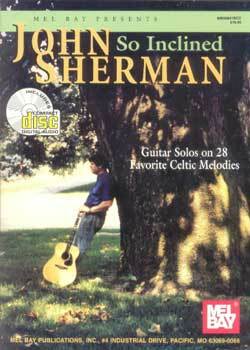 John Sherman So Inclined PDF + Mp3 CD download. For fingerpick guitar. Transcribed solos of Celtic acoustic music for intermediate guitarists. Although subtitled A DADGADer’s Guide to Irish and Scottish Music, the tunes in this book are actually written for the guitar tuned a whole tone higher – EBEABE, and a capo may be applied to match the keys often used in Celtic music (G, D, and A). The author insists, I am still a DADGAD player in the operation sense, and offers detailed recommendations on compensatory string gauges. Download John Sherman – So Inclined PDF free and other books from our site. Only high quality PDF scans. Please write a review, it's important for our community.